Articificial Intelligence (AI) is an area of computer science that emphasizes the creation of intelligent machines that work and react like humans. For instance, speech recognition, learning, planning, problem-solving and facial recognition are left to human capacity. Amazingly, machines can do the same quickly, albeit with cautionary degrees of accuracies. It's acceptable to say, AI makes inanimate devices - such as smartphones - assume the roles of humans. This gives room for humans to do what they do best at a faster rate. Extension and expansion of creativity, among others. The use of AI on smartphones is not all that new, but the growth is progressive. A report by Gartner showed that 10% of smartphones have AI capabilities that provide data protection and power management. Similarly, projections were made to attain 80% by 2022. Already, Google AI Assistants and capabilities on smartphones have risen to 46.7% in the last few years. Now, Google has taken a major step in increasing the AI capabilities of smartphones powered by Android. With Android 9 Pie AI features, more data protection, automation, and personal profiling have become easier. 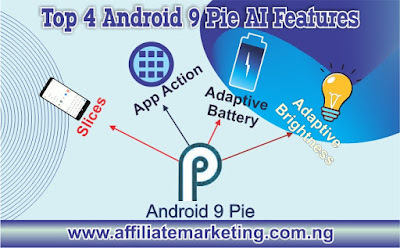 In this posts I will highlight 4 key Android 9 Pie AI features that Google has included in the latest version of the Android OS. Though there are other features that make this OS a must have, these are the key AI features packed with it. Recent OSes such as XOS Chameleon, HiOS, Android Oreo, etc. have introduced this feature as a means of boosting the battery performance of smartphones, and quite a number of users are akin to this. These previous versions allow you to set screen brightness to automatic making the screen's lighting to either increase or decrease, depending on the environments. Not only does this boost battery, it aids vision especially in bright environments. 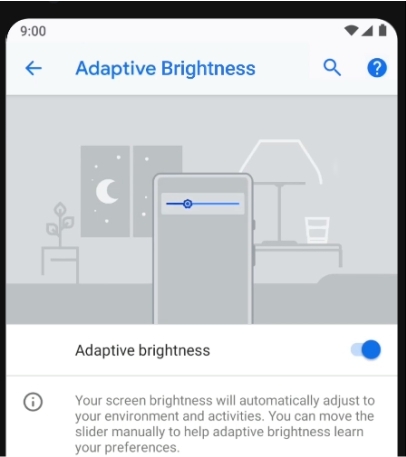 Android 9 Pie Adaptive brightness goes beyond automatic adjustments to user-based environment sensitivity. It studies your preferred brightness in different environments. With this, the brightness of your devices is automatically adjusted to suit your preference in a particular environment. The need to often adjust this is completely eradicated giving you time to concentrate on other things. This is one of the Android 9 Pie features that matters a lot, and one that contributes immensely to the performance of smartphones. Managing smartphones' battery is much of a necessity since such phones utilise much power. Apps, services and background processes can drain power quickly. Hence, the need to control how these features utilise power. Though there are third-party Apps and a few customised Android OSes that boost battery, Adaptive battery eclipses them all. 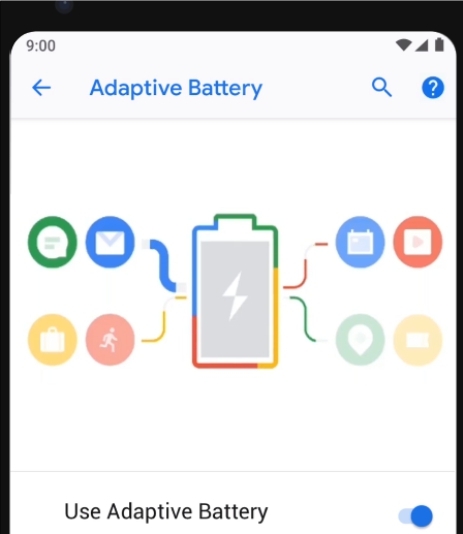 No need for third-party apps or manual actions, Adaptive battery learns how you use your phone - the apps and services you mostly use. Adaptive battery then supplies enough power to these apps. On the other hand, the supply of power to the apps you scarcely use is limited, ensuring that power usage is optimised automatically. This is a very useful AI feature. Most users rarely use some apps and services on their devices. Some of these rarely used apps and services utilise power without much control. With Adaptive brightness, automatic battery management is activated to extend the performance of the battery. Think of slices as an innovative approach provided by Android 9 Pie to enable users to access information and services faster within the Google Search App. This works excellent with Google Assistant and App Actions to add more dynamism. Backward compatibility has been provided way back to Android 4.4 ensuring that about 95% of users will access this feature without hitches. Developers can add this feature to their existing and new apps. Google has equally provided technical support for developers to extend the capability of their apps and thus integrate this feature. You type some text into Google Search App and options will appear with parts of an app displayed to speed up decision making. For instance, if you enter Lagos in the Google Search app and having an Uber app with Slices support, you will get the distance, routes, nearest car, and price for the journey without the need to open Uber app. Another use is in the area of shopping. Assuming you have been using Amazon app on your smartphone for purchases, you can easily search for a product using Google Search. With this, options on prices, vendors, delivery duration, etc will be displayed by the Amazon app to give you quick insight. Slices are indeed interactive, dynamic and excellent AI breakthrough. App Actions learns your frequent and favourite actions over time. It then goes on to show trends of actions that allows it to predict what you want to do next. With such predictions, App Actions can automatically activate processes that you commonly use at particular periods of the day. For instance, if you're used to calling your business partner by 4pm after deactivating silent mode, App Actions will activate the call interface to remind or aid you in making such call. If you normally launch YouTube App after plugging a headphone to your device to stream videos, App Actions will prompt you to launch YouTube App with just a tap when next you plug a headphone to your device. This saves you extra taps, especially for apps, documents or services you access with many taps. Generally, App Actions studies your phone usage habits and uses that to speed up possible actions you want to carry out. Artificial Intelligence on smartphones is an evolving technology with a brighter prospect due to the wide range of support it receives from developers and manufacturers. Its benefit in boosting performance and maximising time remains irreplaceable. Additionally, security, automation, and machine learning are crucial in meeting the desires of the bulk number of smartphone users. Android 9 Pie AI features combine nicely to give users a comfortable experience driven by smartness, speed and flexibility. This is just a step in several that can be achieved in the nearest future with AI. 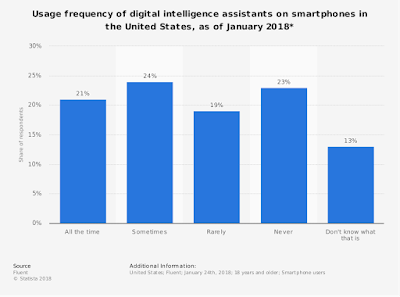 Already, a survey by Statista revealed that about 64% of Americans use digital assistant intelligent on smartphones, while a meagre 36% don't use or know nothing about it. This reveals the future of AI in smartphones and digital devices. The growth will climax as manufacturers develop hardware and software components to support its existence. For now, Android 9 Pie has taken a great step in extending AI features and capabilities to users of Android phones.